This is America's cautionary tale about working too hard. In the ballad, told countless times over more than a century, the railroad worker John Henry wins a race against a new steam-powered drill, but the victory is Pyrrhic: he collapses, saying, "Give me a cool drink of water before I die." "Did he win? Did he lose?" wonders novelist Colson Whitehead. "By the '60s," remarks Scott Nelson, a professor of history who wroteSteel Drivin' Man, "John Henry is looked down on, as being an Uncle Tom character. ... The black man who's always willing to do what the white man wants. There's a division between brain and brawn." Whether or not the story has historical roots --- it's uncertain --- his race has come to represent the heroic struggle of men and women to maintain the dignity of their labor against encroaching technology. A chess grandmaster going to battle against Big Blue is compared to John Henry, andThe Onionheadline reads, "Modern-Day John Henry Dies Trying to Out-Spreadsheet Excel 11.0." But it wasn't always so. Studio 360'sDavid Krasnowtraces the ballad back to its origins as a cautionary tale, and finds theanswer song: a blues about a railroad worker who wants no part of martyrdom. 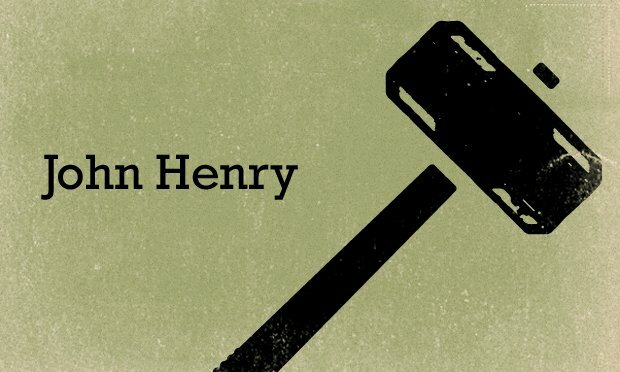 "John Henry was a steel-driving man. He went down," the song goes. "Take this hammer and carry it to the captain. Tell him I'm gone." Video: Joe Bonamassa's "John Henry"
Video: Mississippi Fred McDowell's "John Henry"
Video: Woody Guthrie's "John Henry"